Those of you who are new to knife sharpening may be wondering, what exactly are sharpening stones? According to Wikipedia, sharpening stones are stones that are used to grind and hone the edges of steel tools and implements. Whetstones can be divided into artificial and natural stones. Artificial stones usually come as a double sided block with a coarse grit on one end and a fine grit on the other. Click the Wikipedia link above for more information. Okay, now that we’ve got that out of the way, let’s dive right into the pros and cons! Complete Sharpening Control – Sharpening stones generally allow for sharpening control; The King 2 sided sharpening stone is no different. What do I mean by complete sharpening control? 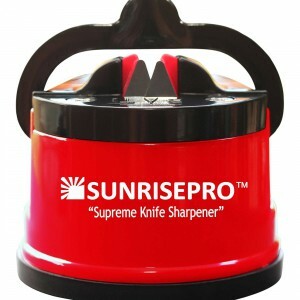 No angle guide restrictions as is the case with most electric and manual knife sharpeners! Here you can alter your angle to suit your needs, and you can purchase more grits if you wanted even more control! History – The King 2 sided sharpening stone comes with a lot of history, as do all sharpening stones. In case you didn’t know, electric knife sharpening did not exist 30-40 years ago. Back then, knives were sharpened by grinding against stones. In fact if you’re like me, you probably recall having sharpened your pocket knife against a rock/stone when you were younger! My point here is that sharpening stones have been around for ages, and the fact that they’re still around indicate how well they work! Versatility – As you can imagine, sharpening stones can be used to sharpen pretty much anything and everything. The King 2 sided sharpening stone can be used to sharpen axes, knives, lawn mower blades, and most other tools. You could sharpen the tool on the stone itself, or use the stone to sharpen the tool (depending on how bulky the tool is). 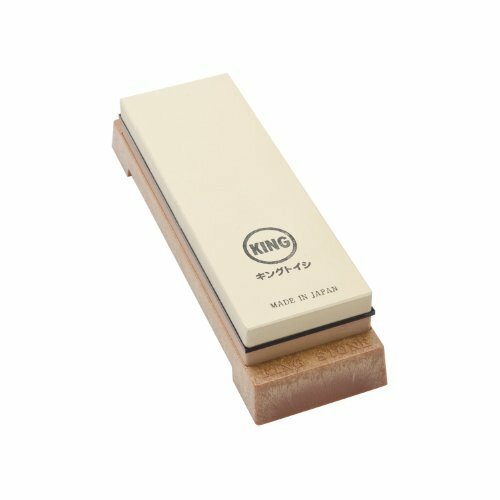 Quality – The King 2 sided sharpening stone is a quality product if used correctly. There is no question about how sharp your knife will be after using these stones. I would strongly suggest you watch tutorials on using a whetstone prior to actually sharpening your knives. Grits Are Unlabeled – Both 1000 & 6000 stones are unlabeled, so you really have no way of identifying which is which other than feeling the coarseness of each stone. The 1000 is orange and the cream is 6000. This is not a huge deal, but clear identification of the stones would be nice! 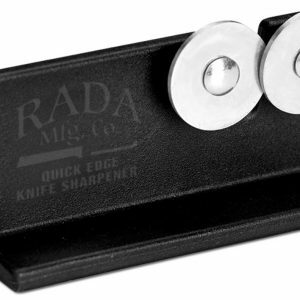 Technique – There is a sharpening technique required for the King 2 sided sharpening stone. This could be an issue for beginners in knife sharpening, as there is no guide to ensure you sharpen consistently at the correct angle. However, knife sharpening is not rocket science and like anything else, the correct sharpening technique can be learnt! Let us know what you think of the King 2 sided sharpening stone by clicking on the reviews tab above and sharing a comment!